Analysis: The race for Mayor has exhausted the public and revealed the candidates in oppressive detail. Former-mayor-candidate-again Kathy Taylor, a national Democrat operative, is spending millions more than the job pays, obsessively controlling her message and spying on her opponent. Thank God she doesn’t work for the Department of Homeland Security, NSA or fly drones like her friend President Obama. Negative ads and hyper partisan people are screaming daily through all broadcast and cable channels, the Internet, and by personal phones without restraint. Tulsans are sick of it. Most of those who will vote decided months ago. Taylor’s latest employee to be found staking is Jack Hardwick, 23, of Norman who was hired to follow Bartlett. He’s been at campaign and public events for a couple of weeks. KOTV Channel 6 has video in a report. Click here for that report. Caught one day after the daily newspaper endorsed her, the daily defends with typical spin minimizing with the title “intern” then quoting their usual leftist OU Professor Keith Gaddie claiming it happens all the time, “Having somebody out in front of a house, you don’t usually hear about it, but that doesn’t mean it’s not necessarily unusual,” he said. So professor, no one hears about it and yet you assert it is usual? Based on what non-record or unheard report Professor Gaddie? Any instances in Oklahoma or in Tulsa noted at any time in history Professor? Just pulling this from your dark inner place of deviousness Professor? 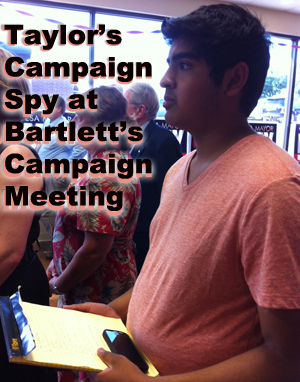 Taylor campaign spin diminishes the incident further asserting, “The intern, who was reading a book in his car when police approached, was not spying on the mayor and was there only during the day to follow him to public events and document his public comments. This is a standard campaign function, and in no way is it used for intimidation,” Taylor Campaign Manager Monroe Nichols said in a written statement. “At no time have any of our interns disrespected or even approached Dewey Bartlett, his staff or anyone associated with his team.” That is a lie. Click here for the report from the Tulsa World. This is the third documented case of Taylor’s spies. The first was at a campaign team rally in Bartlett’s campaign headquarters covered on Tulsa Today. Click here for that report. The next recorded instance was a Taylor campaign operative attending the Republican Birthday Bash and Rally. At this event the operative signed in as a ORU student – a total lie and somewhat funny for an alleged “Harvard man.” A record of his sign in was retained and is available. Contrast the “we didn’t do anything wrong” attitude of the Taylor campaign with Kathy Taylor’s treatment of the press when asked about her violation of election law reported by KJRH here. 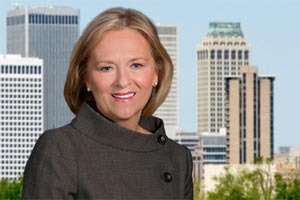 Tulsa Today in a series of special reports will cover the mayor’s race, the auditor’s race and the near billion dollar capital improvement (tax) package in coming days as the election next Tuesday will decide leadership and debt levels for the City of Tulsa for many years. This entry was posted in Local on November 5, 2013 by admin.